It's easy to oversimplify and generalize truth. Doing so can make it seem shallow or trivial. But my observation is that teachers who teach well take difficult to understand truth and make it simple. This enables people to gain a good understanding of what's taught and internalize it. My basic philosophy of learning is that unless a person (myself included!) struggles to think something through, they won't fully understand it or internalize it. Simple questions and challenges to see truth from different perspectives are useful in stirring up productive thought. I've been writing on a certain track of thought with previous posts (see links below) and want to bring it to a conclusion—there is only one throne and one King of Kings believers need to submit their life to and this is based on the simplicity and depth of the gospel of Jesus. The presentation of gospel truth—the good news of God's redemption for all humanity—is most often given in bits and pieces within a western cultural context. I wrote about this earlier. A cursory reading of the New Testament (NT) reveals the gospel is presented in five narratives—4 Gospels and a history of the early church (Acts). The remainder of the NT books explain this gospel narrative and give an understanding of how the truth of the gospel and its theology impact daily life within the church and among people outside the church. The larger narrative of God's Story, as it unfolds throughout the Bible, is important for those unfamiliar with the theology of redemption. Even Revelation, the last book of the Bible, is a heavenly narrative of how God's Story will conclude at the end of the Age. Consider again how truth is processed by different people with different world-views. Generally speaking, western thought presents bits and pieces of information strung together until the whole picture is seen. In MOTROW, information and truth are understood as a whole, while bits and pieces are only seen as part of the whole. When the truth is presented in bits and pieces a disconnect between what is believed and how one lives often happens. The post-modern mindset is similar to MOTROW when it comes to understanding truth. This mindset may still approach things in a linear fashion, but there's a freedom to associate other truth or information to a belief. This leads to a belief system like Moralistic Therapeutic Deism mentioned in a previous post. A common emphasis in American Christianity is on what is termed a performance-based Christian faith. This is the idea that I need to do something as proof of believing in God or being a Christian. I need to give something to show my commitment to God. This is often spurred on by well-intentioned calls to the altar—to accept Christ, to recommit your life to Christ, to serve Christ, and so on. As mentioned in an earlier post, altars are for offering sacrifices and gifts. I see this as an expression of self-focused performance, especially when repeated many times in different services. Are these responses or calls to some altar of self-sacrifice genuine? Yes, often they are. But the question ought to be, are they necessary? I realized long ago that there were only two vows a person ever needs to make—one to follow Jesus and the other being joined in marriage. Both are all-inclusive and exclusive. Neither requires any additional commitments because they are all-inclusive commitments. The call to follow Jesus is simple and requires no further clarification—Matt 16:24; Luke 14:26-27, 33. God's view of marriage, repeated four separate times in the Bible, is just as simple—Gen 2:24; Matt 19:5; Mark 10:7, Eph 5:31. Some may argue, "But there's more to it than that!" But I ask, does God see it that way? Reading through the book of Hebrews, I'm reminded of the great access provided for believers in the New Covenant established by God's grace—direct access to God's presence. There are no minimum requirements for entering and remaining in the Kingdom of God. The only thing God asks is that we come to Him—Matt 11:28-30. What compels you to seek God? So, back to the question—altar or throne? How are you compelled to come to God? Are you offering Him something rather than yourself? Or, are you coming to Him in all circumstances, good or bad? When my children were young and I was a young pastor, I had an open door policy for my children and wife when I studied for messages. I can become so absorbed in studying that I block everything and everyone out. My wife would remind me of my need to make myself accessible to my children and her., so I didn't elevate my work or my interests over them. This is how I see a believer's access to God's presence. I can come at any time, in any condition, in any situation and His door is open. I don't need to offer anything or ask special permission. The Lord Jesus and the Holy Spirit are our promised intercessors (Rom 8:26-27, 34) ready at all times to hear us and be our advocates. Nothing and no one stands between believers and God. How are you compelled to come to God? Are you offering Him something rather than yourself? Even as a young believer, I felt manipulated to respond to altar calls. I don't like being manipulated with emotion, nor do I want to just do something because it's expected or because I feel guilty about something. I'm not against altar calls per se, just the manipulative way they can be used and the assumptions made based on responses to these calls. I'm especially concerned about the self-effort I see people exerting to get into God's good graces. It's just not necessary. God didn't ask Abraham to offer his son Isaac more than once. God accepted it and declared Abraham as righteous by faith (Gen 15:6; 22:1-18). Jesus only died once to justify those who trust in Him (Heb 9:12-14), this is made clear in several places in Hebrews. Is there any need for doing something additional? If you think so, you don't understand God's grace. God doesn't manipulate us nor does He use guilt or shame to bring us to Him. I laid my life at God's altar and I made a vow to my wife over 45 years ago. I don't need to make any more vows or make any sacrifices to gain the Lord's acceptance. I approach God's throne with confidence when I am in need, though I still fall far short of perfection. My perfection—my sense of completeness—is only found in my Lord and Savior Jesus. I had nothing to offer long ago and still don't, but He has all I am. Jesus calls each of us to deny our self and take up the Cross, and then follow Him in faith. He doesn't ask us to make more vows at an altar of self-sacrifice. He invites us to come to Him because of His grace, and as the traditional hymn declares—Just as I am. Some things just can't be improved on. Not that people don't try. The 3 R's of education—reading, (w)'riting, and (a)'rithmetic—are still essential to a sound, practical education. Various approaches and strategies of learning have been tried, but the basics, and even the old one-room schoolhouse environment, have great merit. Fads and trends come and go in most areas of life, especially when it comes to diets. The basics of good nutrition, limiting calories, and regular exercise are still fundamental to good health. So it is with the Christian faith, especially its core—the gospel. Different paradigms and approaches are popular for a time, but the redemptive story of God's love is still the most simple and powerful element of Christianity. Over the years, I've heard sure-fire ways to share the gospel. The idea being that someone would have to believe once they heard one of these approaches. The problem is one size doesn't fit all. Another difficulty is being so focused on the approach, we fail to connect with people in a personal way. They sense this and resist or outright reject what we offer. When I was wandering in spiritual lostness, and under the influence of a mind-altering substance, I was approached by a couple college guys. I was in a different reality and mindset than them. After sharing their plan of salvation with me, they tried to fend off any resistance I might have. They told me, "You can still have a sports car and be a Christian!" I was not in the least interested since I subscribed to the popular mantra of the day—turn on, tune in, drop out. As addressed in my book, evangelism and sharing the gospel are too easily reduced to, "Jesus died for your sins." While this statement is true, it doesn't tell the whole story—the gospel story of redemption. The essential gospel (my version) has three elements— He (Jesus) came, He died, He rose. These three essentials are also expressed in what I'll call the 3 R's of the gospel—relationship, redemption, and restoration. Relationship with God should always be a priority when sharing the gospel. Relationship is at the heart of redemption. Redemption reveals the heart of God. This is expressed in the first eighteen verses of John (John 1:1-18), which summarizes the whole book of John. It's easy to get caught up with terminology and definitions when explaining redemption. A simple way to describe it is the act of rescue and reconciliation. This is expressed in 2 Cor 5:17-19. If our intent in sharing the gospel isn't reconciliation, then we're missing the point—a point illustrated by the three parables of Jesus in Luke 15. I sum up the idea of God's work of restoration as the end which is the beginning again. What was lost in Eden is restored by Jesus on the cross. The redemptive work of Jesus restores humanity to a state of innocent relational trust, which Adam and Eve knew in the beginning. This points us toward the end of the age, as seen in the book of Revelation. We look forward to the Lord's return for His restoration of all things (Acts 3:19-21; Rev 21:3-5). Much more could be said but isn't necessary. Sharing our faith and God's story of redemption should be both simple and true, not clever. God desires a relationship with all people, and we, His creation, were created for that purpose. Relationship with God comes through faith—trusting in Him and His work of reconciliation on the cross. Deep down, everyone knows they need restoration. King David declared, "He restores my soul" (Psalm 23:3). This is what a world wandering in darkness seeks, and we followers of Christ are charged with sharing it with them (Matt 28:19; Mark 16:15; Acts 1:8). When was the last time you shared the gospel and your story of faith with someone? Need Help on How to Share Your Faith? Evangelism. What does this word bring to mind? Typically, most people think of street preachers, revival tents or mass crusades, and handing out gospel tracts. But the most effective means of evangelism, since the time of Jesus till now, is personal evangelism. Person to person, relational, intentional sharing of God’s Story—the gospel—in a personal way. Some people are called to be preachers, whether on a street corner or in an auditorium. Others are quite bold and confident in approaching people in any circumstance for the sole purpose of sharing their faith. But not everyone is like this. I’m not. Even though I’ve preached in church pulpits, public outreaches, on the radio, and handed out tracts on the street, evangelism is not what I'm inclined to do. I'm not an evangelist. Many people are not equipped, nor called to traditional public evangelism, but we are all called to be ready to share the hope we have within us—Jesus—and our relationship with Him (1 Peter 3:15). The hindrance for many of us sharing our faith is timidity and lack of confidence, but the key is focusing on building a relationship. A more typical focus is on the mechanics of how it should be done or the content of what needs to be said. But when we look at the example of Jesus in the Gospels, we see a very tailored, personal approach. When I share on evangelism, I encourage people to consider how each of their life stories connects with God's Story. I also encourage people to use biblical storying to share their faith with others. Compare Jesus' example to the more common approach of monopolizing a conversation with a prepared spiel, in an attempt to convince people they are sinners. 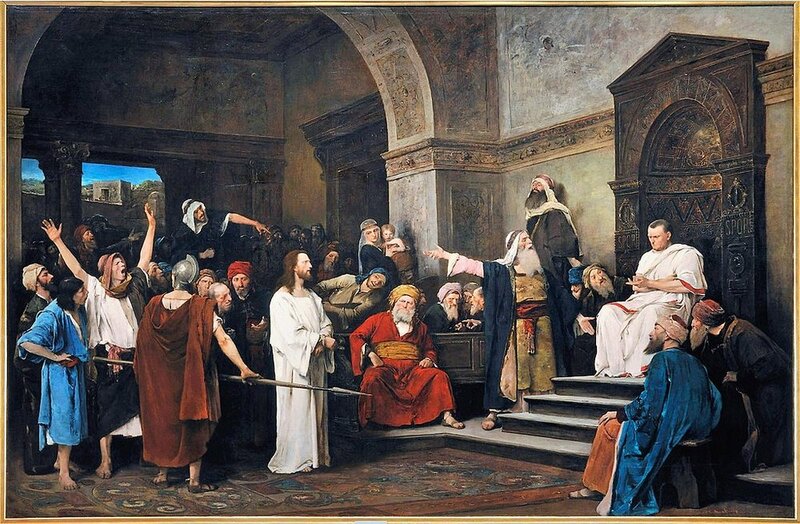 We see Jesus' example early on when He was in the temple among the Jewish leaders and rabbis (Luke 2:41-50). Jesus is found “sitting among the teachers, listening to them and asking them questions.” He isn’t preaching to them, but listening and asking questions. Further along in the gospel narrative, we find Jesus engaging people with stories and wise sayings called parables. He often used questions when challenged by the Jewish leaders, asked questions of the crowds of people when He taught them and used questions when He explained things and to exhort His disciples in private. Jesus engaged people from all backgrounds and stations of life. He seemed to tailor His interaction with people to their level and state in life. He treated those with questionable backgrounds and character with unexpected dignity. He rubbed shoulders and ate with prostitutes, drunks, unethical business people, political agitators, and the like. And His band of followers included uneducated fisherman and tax collectors (renegade IRS-agent types) to mention a few. His tactics were different than anyone expected, which included His followers and the Jewish spiritual leaders. His tactics were different from what is customarily seen today. Jesus' way is different than what is found in most evangelism training programs and books on evangelism, let alone stereotypical evangelists, whether well-known or not. How can we learn from Jesus' example? It just might make sharing our faith with others easier, and more fruitful. People, worldwide, know they are sinners in some way or another, or at least that they are less than perfect. Most people, throughout the world, are lonely and often feel less than important. When someone shows interest in them and is willing to listen to their story, they take notice. I have found this true traveling nationally and internationally on planes, and in airports, and other situations. One reason people seek out a counselor or therapist, even in social networking, is to find someone who will listen to their story. Here's a simple starting point for personal evangelism. Simply ask a person about himself or herself. Who are they? What do they do in life? Just show interest in them. Genuine interest. This builds rapport, the beginning of a relationship. It establishes interest and even a sense of trust. It builds a bridge that makes it possible to share your own story and the greatest story—God’s story. This requires genuineness above all. Most people are perceptive enough to know when you are listening to them, or just listening for an opportunity to break in and say something. Once you hear a person’s story, you've built a bridge of respect and trust. This will often give you an opportunity to share your own story, your life story of faith. This isn’t a complicated or new approach. In fact, it takes place many times a day, often without any intention. It just happens. Wouldn't it be nice if sharing your faith just happened in a natural way? It can. I'll post a follow-up to this next week... so stay tuned! Think about what I've shared so far. Take some time to look at how Jesus engaged people with the truth of His story—God's story.